Using Adaxes, you can delegate Office 365 management tasks to users. For example, you can allow users to activate and deactivate accounts in Office 365, assign and revoke Office 365 licenses, etc. The rights to perform Office 365 management tasks, like any other rights in Adaxes, are granted with the help of Security Roles. By default, some built-in Security Roles contain the Write All Properties and Full Control permissions that grant the right to perform all Office 365 management tasks. In this tutorial, you will learn how to add permissions to perform various Office 365 tasks to an existing Security Role. 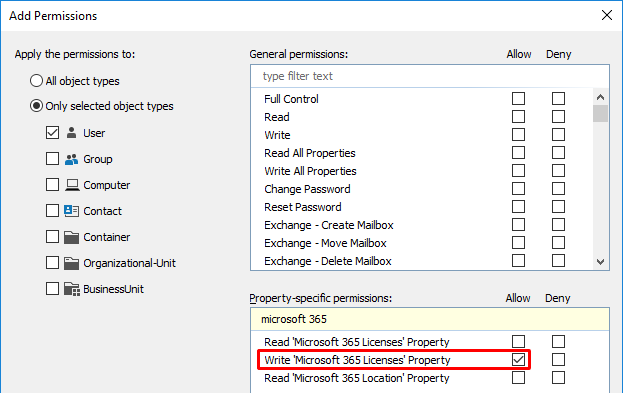 To delegate full control over Office 365 accounts, select the Write Office 365 Properties permission in the Allow column. Type Office 365 in the filter edit box to filter out permissions unrelated to Office 365. Check the desired property in the Allow column. For example, to delegate the right to assign and revoke Office 365 licenses, check the Write Office 365 Licenses permission in the Allow column.